How does promoting breast cancer awareness fit into a propane truck manufacturing business? It started with Jim Rymes, Jr., fleet and bulk plant operations manager for Rymes Propane and Oil in Keene, NH. 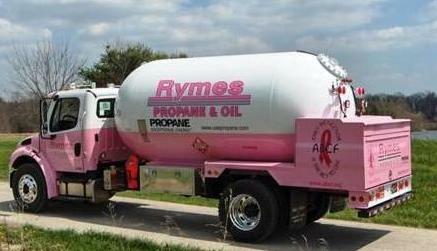 Because of his love for the propane truck business and his family’s support of cancer awareness, the outcome was a big pink and white bobtail with the Rymes logo printed on its pink sides. While the propane business may seem to be a male-oriented business, Jim had few misgivings about requesting a pink bobtail from his favorite truck supplier, BT&T. Shawn Auxier of BT&Twas enthusiastically on-board with the idea as soon as he heard it. Shawn was so excited about the project that he became the driving force in establishing the Propane Manufacturers and Distributors Campaign for Awareness, which was inaugurated at the Southeastern Convention and International Exposition in Atlanta, GA in 2006. The unveiling of Rymes’ pink bobtail at the show launched the national effort by Shawn and BT&T, along with several industry manufacturers and distributors. Once Rymes’ order was in, Shawn called his suppliers to see if any would be interested in joining a bigger campaign. The response was overwhelming. Jim’s simple, but local idea – to paint his truck pink with some verbiage on breast cancer awareness as well as to donate a portion of the profits to the American Breast Cancer Foundation – blossomed into a national campaign. Shawn’s and Jim’s efforts to get donations from suppliers resulted in contributions exceeding $30,000 back in April 2006. Nearly two dozen companies agreed to give money, and in most cases an amount equal to or more than the piece of equipment they donated. Later Shawn and Jim came in contact with Susan Sweitzer at the American Breast Cancer Awareness Foundation where they came up with the slogan “Save Them.” The idea for the slogan, said Shawn, is to encourage the men in the industry to get the ladies in their life to a breast screening. The money raised through the manufacturing of these “pink” trucks have been donated to the foundation’s national Key to Life Program, which provides funds to women and men in need of breast cancer screening and biopsies. Grants are also available through the program to those in need of different types of assistance, including financial and medical. Rymes’ donation has gone to the foundation’s New Hampshire Key to Life program. The idea of manufacturing pink trucks for awareness caught on, said Shawn. Over the last few years we have built about 16 trucks, including one we just finished for Superior Propane in the Ontario, Canada region. The pink-ribboned truck hit the streets in Ontario in late August 2009. The unveiling marked the launch of a national effort by the Canadian Breast Cancer Foundation, the leading volunteer-based organization in Canada dedicated to creating a future without breast cancer. Piggybacking with the American campaign, Jim Pinder, Superior Propane Fleet Specialist, said Superior’s new truck has been making the rounds in Ontario – from Toronto to Wawa, Chatham to Pembroke, and a lot of places in between. The truck manufacturers, including BT&T, Liquid Controls, Base Engineering and Kenworth’s Pac Lease group made donations valued around $10,000. Superior Propane donated one-third of a cent per liter delivered by the truck. So, if the truck delivered two million liters in one year that equaled about $6,000 for the Canadian Breast Cancer Foundation. If your company would like to build a pink propane truck, bobtail or transport to support breast cancer awareness, please contact us at 800.825.7288 or email contact@btandt.com.